Welcome to Dance Etc.! Feel free to submit your registration online. Questions?? 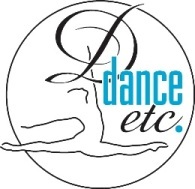 Give us a call at 513-576-1400 or email us at info@dance-etc.com. If you are not able to register for your desired class it could be that you child is above or below the age range for the class. We can help you pick out a class that is age appropriate for your child. The Undersigned is the (parent or legal guardian) of the child(ren) listed on this page, hereinafter the "Minor(s)". The Minor(s) is/are person(s) under eighteen years of age. Dance Etc., Inc. is an entity conducting the business of teaching and training persons in the activities of tumbling, dance, cheerleading and other related activities, including, but not limited to, practicing in participating in performances and/or competitions. The Undersigned recognizes and acknowledges that there are inherent dangers for personal and bodily injury to the persons who are being taught, trained and competing in those activities referenced above. In consideration of Dance Etc., Inc. permitting the Minor(s) to participate in those activities identified above, the Undersigned, on behalf of Undersigned and the Minor(s) and (his/her) heirs, executors and administrators, does hereby release, acquit and forever discharge Dance Etc., Inc., their officers, employees and agents of and from any and all liability to the Undersigned and/or the Minor(s) and/or (his/her) heirs, executors or adminitrators for any and all personal injuries, bodily injuries and losses whatsoever, which the Undersigned, the Minor(s) (his/her) heirs, executors or administrators may hereafter accrue on account of or in any way growing out of any activities identified above, whether caused by the negligence of the Releasees or otherwise. The Undersigned agrees that this release shall apply while the Minor(s) is/are traveling to or from any of the said activites and irrespective of the location or facility where the said personal injuries, bodily injuries or losses occur. The Undersigned agrees that this release is intended to be as broad and inclusive as permitted by and shall by governed by the laws of the State of Ohio. The Undersigned further declares and represents that no promise, inducement or agreement not herein expressed has been made to the Undersigned, and that this release contains the entire agreement between the parties hereto, and that the terms of this release are contractual and not a mere recital. When you register, you are signing up for the entire session (summer - 8 weeks, fall/spring through June 2013). I understand that tuition will be charged until then or until I complete a withdrawal form. Dance Etc. must be notified of all withdrawals in writing 2 weeks prior to your intended withdrawal date. You are responsible for all tuition charged until we are notified of your withdrawal and the 2 week notice is assessed. I hereby give Dance Etc. Inc., its legal representatives, and those acting with their permission, the right and permission to copyright, use, reuse, publish and/or republish photographic pictures or portraits taken by Dance Etc., for use in advertising Dance Etc. in newspaper ads, flyers, posters, website, etc.